Despite Hurricane Joaquin’s threatening rains, the show went on October 2nd as Brevard College honored three alumni, a professor emeritus and a former soccer coach at its annual Gallery of Distinguished Alumni and Faculty and Athletic Hall of Fame dinner at The Porter Center for Performing Arts. The Distinguished Alumni award is the highest alumni honor that Brevard College confers. Benson, of Waynesville, North Carolina, was inducted into Brevard College’s Gallery of Distinguished Alumni, along with Brad Lakeson ’74, of Charlotte. Benson has taken Brevard College’s motto – “Learn in order to serve” to heart and spent her life serving others. In her career as an accomplished educator, she served as Director of Christian Education for the United Methodist Church, as well as a teacher and Director of The Pre-School associated with the King Faisal Specialist Hospital and Research Center in Riyadh, Saudi Arabia. Rev. Dr. David C. Joyce, Brevard College President, presented the award to Lakeson, who was a student leader, played on the soccer team and was active in extracurricular activities during his time at the College. “Brevard College was an excellent fit for me because the smaller classes permitted an excellent learning environment,” Lakeson said. “Basically Brevard College was and continues to be like a family to me.” He has been a dedicated advocate for BC through his service on the Board of Trustees and the Alumni Advisory Board. In his successful career in Sales Management, Lakeson has received many national and regional honors. The late Tim Murray, Professor Emeritus, was added to the Distinguished Faculty ranks. 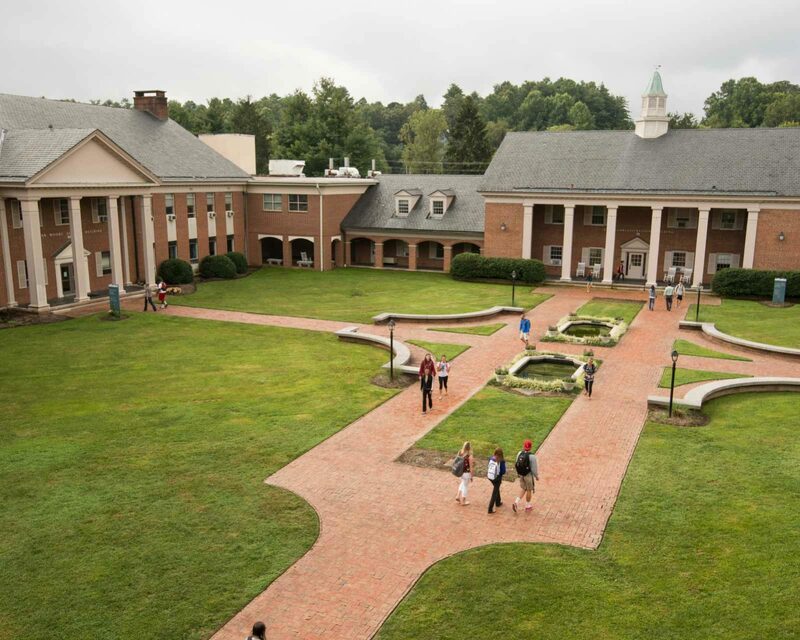 A lover of the arts, sports and the outdoors, Murray found Brevard College to be the perfect place. His BC career spanned 42 years, serving as Head of the Art Department for 40 of those. Murray loved teaching and cared deeply about his students. Over the years, Murray won countless awards for his art. Bianca Mitchell, a 2003 graduate of the BC Art Program, presented the Distinguished Faculty award to Tim Murray’s family. Mitchell gave a moving dedication to her mentor in front of the nearly packed crowd of alumni, faculty, staff and friends of the College. Former men’s soccer coach Don Scarborough (1978-1987) and player Eddie Tadlock ’85 were inducted into Brevard College’s Athletic Hall of Fame. Scarborough led the Tornados’ Men’s Soccer Program to some of its most memorable victories during his 10 years at the helm, winning eight Regional Championships. During his most successful year, the ‘82 team went 14-4-1, finishing with a No. 7 national ranking. As a result, Scarborough was named Coach of the Year by the National Soccer Coaches Association of America. Scarborough also served as Dean of Students and Brevard’s Athletic Director, holding the positions concurrently with his coaching duties, before stepping away from coaching in the spring of 1988 to become Brevard’s Director of Development. He earned a doctorate from Vanderbilt University in Higher Education Administration and works as the Vice President for Community Relations at High Point University. Tadlock was a decorated midfielder for a pair of conference and regional championship teams. His legacy, however, was not just on the pitch for Brevard, but also in the classroom and in the College community, as he served as the President of the Student Government Association. Tadlock was named to the Who’s Who Among Students in American Junior College in 1984-1985, and continued in his extracurricular activities as he wrote for The Clarion, the Brevard student newspaper, covering BC athletics. Tadlock also was influential in the SGA taking a part community involvement in nursing homes, as well as working with the SGA to improve the election process in the coming years. After leaving Brevard, Tadlock continued his soccer career at Boston University, where he earned a degree in Public Relations. He has spent over 20 years working in the field of public assembly facility management. He is currently the Assistant General Manager of the DeVos Place Convention Center in Grand Rapids, Michigan.